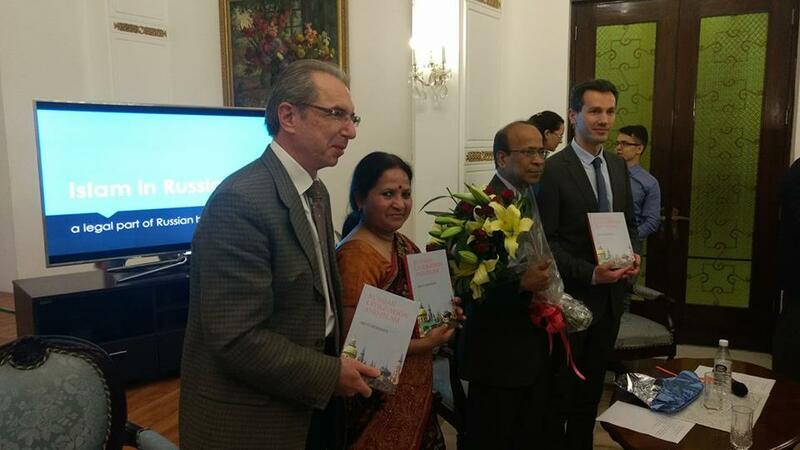 Report by India Education bureau, New Delhi: The great scholarly book on Russian Civilization and Islam written by Professor Arun Mohanty released in Russian Embassy, Shanti Path, New Delhi on 28th Feb, 2017. The book was released by acting Russian Ambassador Anatoly Kargapolov, former Indian ambassador to Russia Mr. Mukharjee, senior councillor Sargei kimalito and others. If we look at the evolution of Russian state, we will find the multi-ethnic and multi-confessional foundation almost from the very beginning of its statehood. Islam is important for Russia not because of its sizable Muslim population alone. It is essential for Russia from the standpoint of national security, internal security and geopolitics as well. Islam plays significant role in shaping Russia’s domestic as well as foreign policy. There are divergent views about how exactly Islam came to Russia. The current Russian territory, where Islam appeared first, was not part of Russia but was subsequently incorporated into the advancing Russian empire. Islam reached the Caucasus region in the middle of the VII century as a result of the Arab conquest by the Iranian Sassanid Empire, centuries before Russian expansion to the region. Arab conquerors reached the main Caucasus mountain ridge, occupying vast territories in Central Asia and the adjoining space. Islam was officially declared as the state religion in the year 912 in the territory of the present-day Tatarstan, known as Volga-Bulgharia in the ancient period. According to historian R. Forheddin, Islam’s expansion to Volga region took place towards the end of the VII and beginning of the VIII century. The public life in this area was organized on the principles of Islam and Islamic civilization in Volga region gradually spread out to the neighboring territory in a peaceful manner. Russian historians stick to the opinion that Bulghar ambassadors proposed to the Great Kievan ruler, Prince Vladimir, to adopt Islam. However, he chose Orthodox Christianity for his country in the year 988. The Tatar-Mongol yoke established its control over Bulgharia in 1240. The Golden Horde gave a strong impetus to the expansion of Islam in Rus during 13th and 14th centuries, when the religion spread into East Europe and West Siberia. In the year 1313, the Golden Horde ruler Sultan Mohammed Uzbek declared Islam as his state religion, which resulted in conversion of multiple Turkic tribes from Crimea to Siberia into Islam. Khan Uzbek instructed his vassals not to do any harm to the Orthodox Christians. Perhaps, this was the period when inter-faith dialogue took roots in Russian soil, and became a rich tradition in subsequent periods. In the history of Russian civilization and state, relations between Orthodox Christians and Muslims may have been complicated at times still never hostile. It is a paradox but the truth is that co-existence of Orthodoxy and Islam continues in Russia from the period of Golden Horde led by Tatar-Mongols. Their inter-relations intensified after incorporation of Khanates of Kazan, Crimea, Siberia and Caucasus into the territory of the Russian state. Islamic cultural influence is vividly seen in Russian architecture. It is particularly evident in the famous St. Basil church in the Red Square in Moscow and the monasteries of Kremlin palace. Eminent Russian Scholar Lev Gumilev, showing intensity of relations between the Russians and the Tatars, pays particular attention to the fact that Russian historians like Karamzin, poets and writers like Derzhavin, Ogarev, Turgenev, Dostoyevsky, Kuprin, Bulgakov, great scientists such as Mendelyev, Mechnikov, Pavlov, Timiryazev, renowned artists like Anna Pavlova, Galina Ulanova, Skryabin, Tanayev, Shishkin, etc. had Muslim Tatar origin. Living for long in the framework of a single state and territory, centuries-old spiritual, social, and human links, collective creation of cultural values and state structure, its collective defense, common destiny form common attitude to the fate of Russia among the multi-ethnic and poly-confessional people. They lay the foundation for strong traditions of tolerant co-existence while preserving original ethno-confessional culture. The revival of Islam in post-Soviet Russia and desire of Russian Muslims to assert their role in cultural, political and public spheres have added new dynamics to their integration in both the state and the society. Russian state’s multi-ethnic and multi-confessional character has been reflected in its federal structure. Country’s top leadership perfectly realizes the significance of “Islamic factor” in the life of the nation; role of Muslim organizations in preserving and strengthening peace, stability and harmony in the society. President Vladimir Putin believes that Russia, being predominantly inhabited by Orthodox Christians, is a Muslim country as well, and the people practicing Islam in Russia are not migrants but are part of its indigenous population. Inter-faith situation in modern Russia largely depends on relations between Orthodox Christians and Muslims. Today, these relations are healthy, sound, forward-looking and positive. It is widely believed that Russian civilization and spirituality would stay incomplete without Islam and Muslim culture. State authorities miss no occasion to reiterate that Russia’s success lies in the strength of its moral values and ideals based on tolerance, inter-faith and inter-ethnic cohesion. The discourse on separate Muslim identity has been developed within the concept of Unity in Diversity. There is an understanding between the state officials and the Muslim leaders that the social stability and spiritual revival of the nation require consolidation of Muslim administration structures, which, in turn, can be effective only in close cooperation with the state structures. If you look at the population of Russia and India from confessional point of view, you will find lot of similarities as well as differences. Therefore, our rich common experience in handling the Muslim issue will undoubtedly be mutually beneficial for the two countries. This volume is the first attempt in India to make a profound analysis of Islam in Russia, its contribution to the Russian civilization and spirituality. The book offers a lot of information about Russian Islam and State-Islam interaction in Russia to Indian readers, provides brilliant account of ethno-confessional composition of Russian population, relations between the state and Islam over centuries, the role of Islam in shaping domestic and foreign policy of the country and revival of Islam in the post-Soviet Russia. The volume provides indispensable expertise and, without any doubt, will be of particular interest for the experts on Russia, foreign policy analysts and the country-research students.